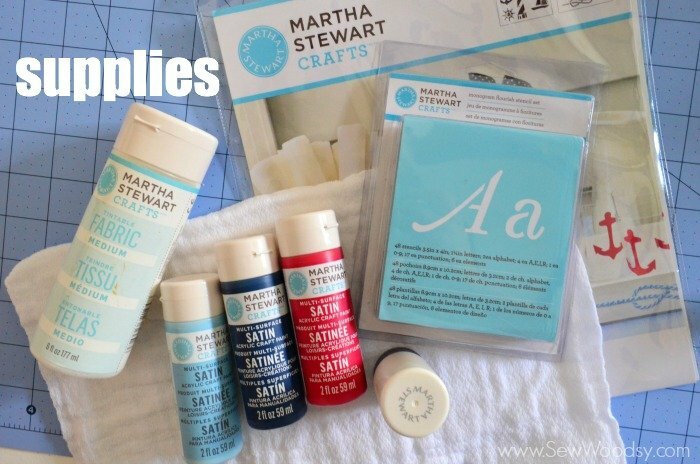 This is a sponsored post on behalf of Martha Stewart Crafts as always all opinions are my own. 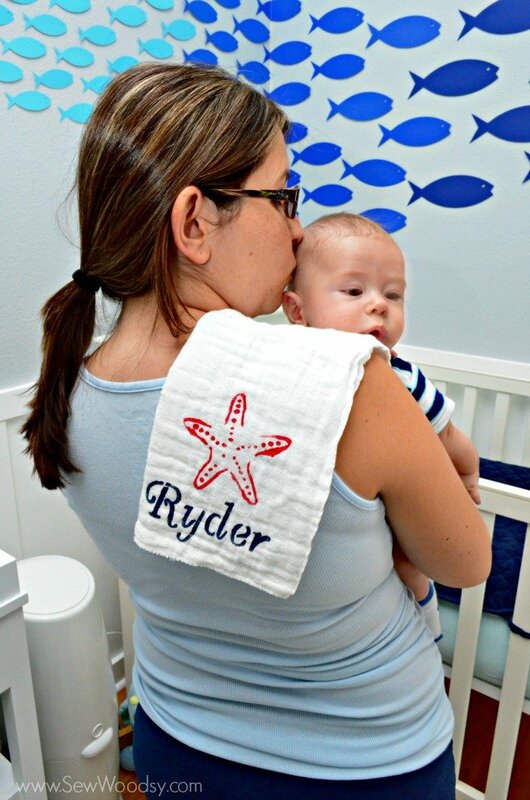 I was never one to like customized clothing, towels, bags, etc… that all changed once I had my son, Ryder. For some reason, I want his name on EVERYTHING. I’m kind of becoming addicted to it. 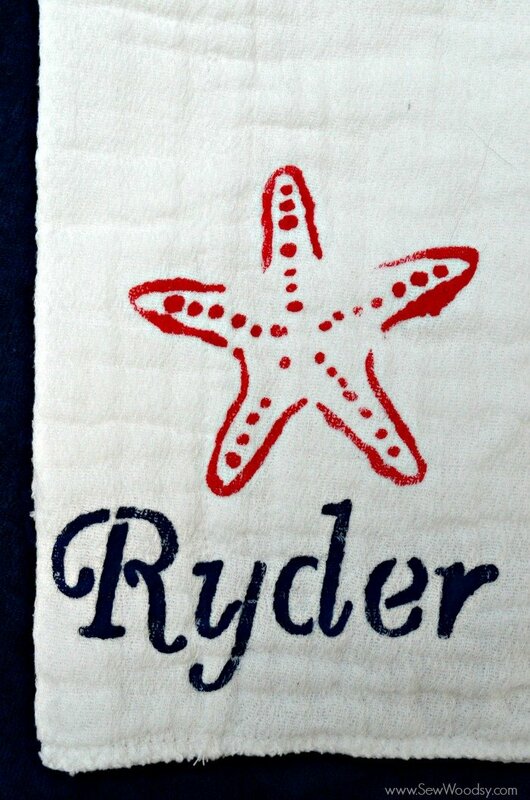 When I got my nautical stencil in last month, I knew I wanted to use it and make a custom nautical burp cloth. 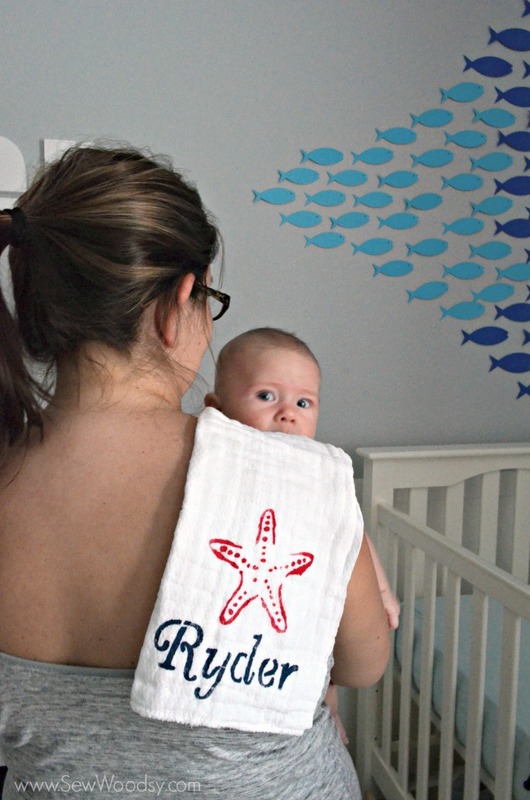 We can never have too many burp cloths. Especially since we are in that super drooly stage. I type that as Ryder is sitting on my lap gnawing on my arm and drool is going everywhere. It kind of grosses me out. So I’ve found that burp cloths are my new clothing accessory. So if I have to have one on me 24-7 I might as well make it cute! First, I punched out all the letters I would need for his name. Then I poured 2 parts blue paint to 1 part fabric medium. I mixed it on to my dish. 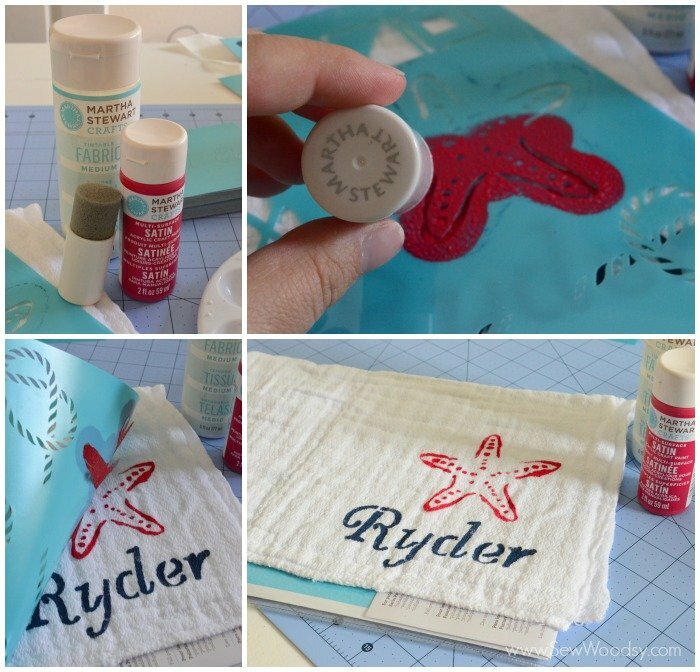 I placed the burp cloth on top of the nautical stencil pouch to prevent paint bleeding through. Using a pouncer I went letter by letter. Giving a good 5-10 minute break in between so that I didn’t mess up the other letter. Once his name was dry, I then added the starfish. I did 2 parts red paint to 1 part fabric medium. Mixed it together and carefully pounced the paint on to the cloth diaper. I let it dry for 24 hours then washed it. And now I’m using this burp cloth every other day! Once again this is a great nap time craft. I would work on a letter and then clean up my craft room in between! 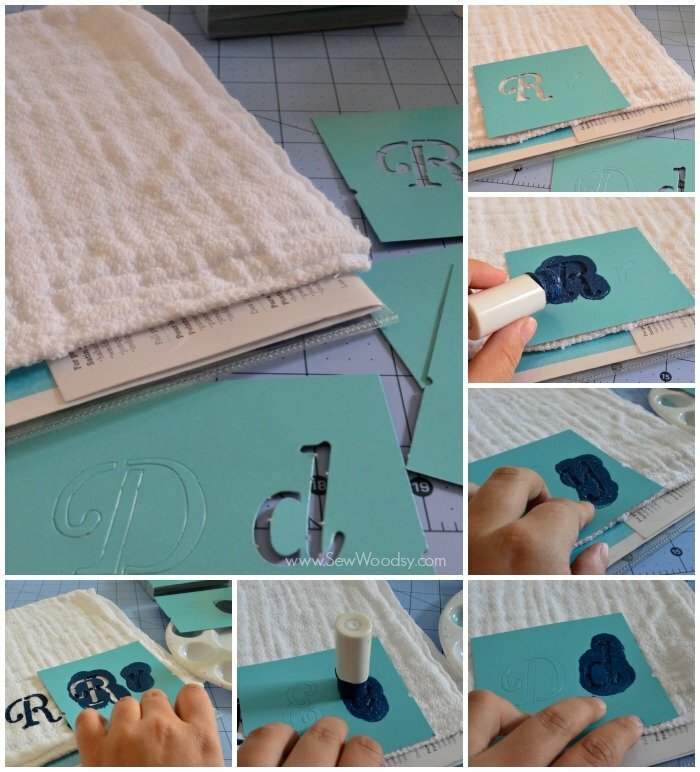 This would make a great gift for a baby shower if you know the baby’s name. Oh and let’s get real… to get 2 decent photos with the baby not moving a mile of minute took us about 30 minutes. Stay tuned tomorrow. I’ll share how I made the fish on the wall. 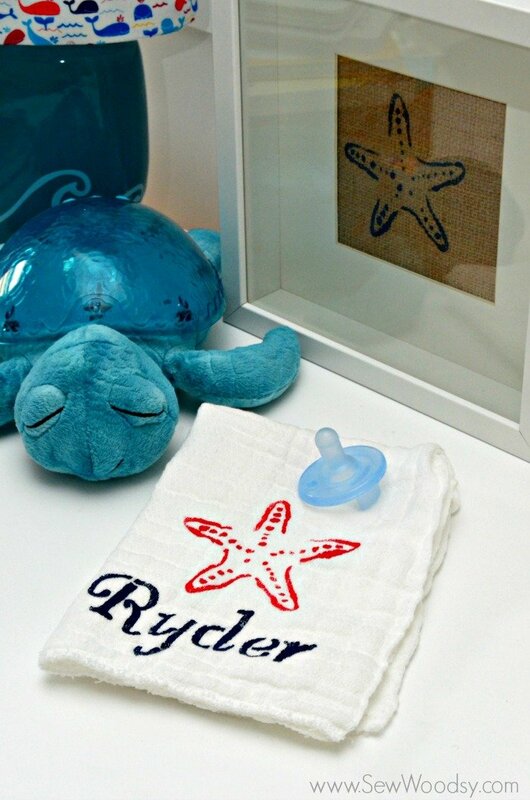 What an adorable project for Ryder! (Of course he is even more adorable…) My friend is having a baby this fall and I’m going to make a few of these for her. 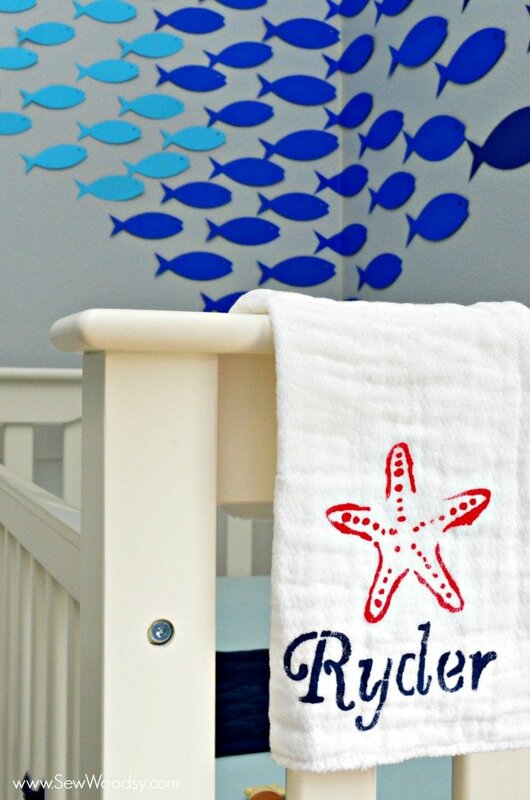 Her nursery theme is whales, so I’ll have to start checking around for a whale stencil. It was great to see you at Haven! Oh fun Paula. You know that I have a thing for whales! It was great seeing you as well. Adorable!! I wish I had a crafty mother lol I can’t wait to see all 3 woodsys’ making things together.